Our geotechnical, environmental, and materials testing specialists provide services to clients in both the public and private sectors. With offices in California, Nevada, Arizona, Colorado, Texas and Utah, our firm is fully committed to being responsive, cost-efficient, and thorough in meeting the clients' project needs and objectives. Ninyo & Moore Geotechnical and Environmental Sciences Consultants was established to provide geotechnical and environmental engineering, soil and materials testing, and inspection services to clients in the governmental (federal, state, and local), commercial, and private sectors. Ninyo & Moore has helped clients develop and implement innovative solutions to geotechnical and environmental challenges since 1986. Services provided by Ninyo & Moore encompass all phases of a project, from the planning stage through design and construction. Ninyo & Moore carries a variety of certifications and licenses required for the performance of geotechnical, environmental, and construction phase inspection and testing services. Ninyo & Moore's skilled personnel maintain professional licensure in states across the United States, and our field personnel are certified to perform a variety of field testing and inspection services. Ninyo & Moore's testing laboratories are accredited and certified by local and national organizations. Additionally, we hold Contractors Licenses in the states of California and Arizona. Ninyo & Moore's strengths lie in the quality, diversity, and technical experience of its key personnel and staff, and in the personal involvement of the principals. Ninyo & Moore maintains its exceptional reputation in the industry by providing high quality technical expertise while meeting difficult work schedules and budgetary goals. Ninyo & Moore's geotechnical and environmental project staff bring a wealth of experience and diversity to any project and includes Registered Engineers (PE, GE), Professional Geologists (PG, RG, CEG, CPG), Certified Hydrogeologists (HG), Certified Hazardous Materials Managers (CHMM), Certified Environmental Managers (EM), Certified Industrial Hygienists (CIH), Qualified Stormwater Developers/Practitioners (QSD/QSP), and personnel with other applicable registrations, licenses, and certifications. Many of our professionals hold advanced degrees and are active in accrediting professional organizations. 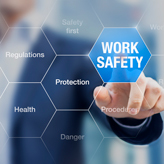 Ninyo & Moore is a member of ISNetworld, which is an online repository for safety statistics, insurance, qualifications, quality and regulatory information for contractors and suppliers which streamlines the compliance process for hundreds of Hiring Clients globally. 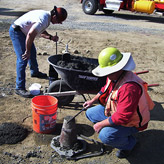 ISNetworld facilitates partnerships to help ensure safer job sites. Ninyo & Moore is a member of the BROWZ online safety repository. Browz offers an efficient means to exchange and evaluate supplier data. Client members are able to access compliance information for all suppliers and contractors in order to help assess their risk exposure, monitor compliance, and make informed subcontractor decisions. Browz independently assesses the data that is submitted, and works with suppliers to update their information, as needed. As part of our on-going effort to maintain client awareness of new developments in the industry, Ninyo & Moore presents annual technical seminars regarding topics of interest to the business community. These technical seminars are presented in our offices, and include a tour of our laboratory facilities. Arrangements can also be made to present our seminars in the offices of clients with large groups interested in attending the seminars. If you are interested in additional information or would like one of these seminars presented at your offices, please Contact Us. Ninyo & Moore welcomes questions and requests from our clients. Please Contact Us.